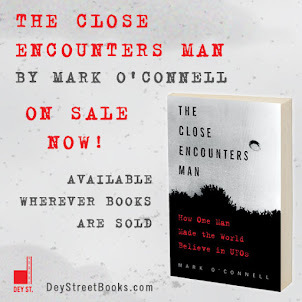 As readers may know, I love to read reviews of my book, The Close Encounters Man. Bad or good, each review teaches me something, and sometimes they just crack me up. Case in point: the Amazon reviewer who panned my book but made the bizarre statement that he knows more about UFOs than the average person but that he had never heard of J. Allen Hynek before--that guy had me laughing all day. "I had a problem with the way in which the 'landmark' cases that are presented, though - particularly the Socorro, New Mexico report of an alleged landing by patrolman Lonnie Zamora - which are not just discussed uncritically; most of them are presented as fact." Obviously the reviewer means this as a criticism, but I don't take it that way at all. Of course I presented the landmark UFO cases as though they had actually happened; that was one of the basic concepts of the book, and one of the first creative decisions I made about how I would write the book. Objective UFO books written by scholars and journalists--they're impressively researched and uniformly well-written, but because the authors want to maintain their critical credentials, they studiously distance themselves from the absurd and sensational qualities of the phenomenon, thus robbing it of its entertainment value. Subjective UFO books written by UFO enthusiasts and "experts"--they're chock full of fun UFO facts and details and anecdotes and they fully embrace the absurd and sensational qualities of the UFO phenomenon, sometimes to the extreme, but the sad truth is that UFO enthusiasts and "experts" are not always very good writers. So I set out to write a book that would cut right through the middle, presenting the UFO phenomenon as a reality to the persons reporting the events while fully embracing the absurd and the sensational. I wanted to write something that was educational and informative, but unabashedly entertaining as well. I know that it's the absurdity and sensationalism that draw me the phenomenon, so why try to pretend it isn't a factor, or that it's beneath me somehow to take it seriously? Of course I didn't always have all five of these sources available for every case (the Air Force, for instance, did not officially investigate UFO cases after 1969), but this was my goal, and I could almost always round up at least three of the five for every case, because, guess what: UFO cases get written about a LOT (even lame ones)! So, that means that throughout the book I present the UFO events as fact, in the eyes and words of the witnesses. I accept J. Allen Hynek's philosophy, often stated in his UFO case reports, that "the witness experienced something very real, although at this time we cannot say what it was," or, more simply, "I believe the experience was very real to the witness." To present the events any other way would, in my opinion, cast doubt on the witnesses and create a strong bias of disbelief in the reader, and in that case, why write the book at all? Much better, I think, to take the witnesses' testimony at face value and then see where Dr. Hynek's research led him in trying to explain and understand the witnesses' experiences. Maybe you agree with my approach, maybe not, but I'm not going to apologize for presenting UFO events "as fact," because that's exactly how they were experienced by the witnesses. Fair call on me not catching that Carl Sagan's trademark "billions and billions" of stars originated in a Johnny Carson spoof. Not fair call on me supposedly not knowing that Dr. Hynek had seen UFOs--read P. 332 of my book. Also not fair call that I didn't read Dr. Hynek's book The Edge of Reality--I've read the book at least three times and I reference it on P. 311-313 and 354. I think maybe this reviewer just stopped reading my book at page 310! I think the Goodreads reviewer should also learn the correct way to construct a positive sentence. I wasn't aware patrolman Lonnie Zamora made an alleged landing. Unlike other countries - such as Peru, Argentina, China - the US has no special agency or commission that investigates, in full transparency, ongoing UFO incidents, and whose findings are accepted as truths. Ironic, isn't it...intelligence agencies issue "assessments" about certain events or conditions without a shred of corroborating evidence, yet these assessments are treated as facts. 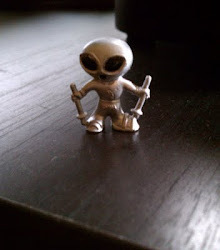 But the most thorough UFO investigations (sometimes with trace evidence) which employed scientifically acceptable methodologies and forensic techniques are not. For the time being I'm sticking with Sherlock: "...when you have eliminated the impossible, whatever remains, however improbable, must be the truth." What I would like to ask that reviewer is how he thinks the UFO events *should* be portrayed, and why. I meant to add I think your approach was the right and sensible choice. Presenting the incidents through the eyes and feelings of the experiencers makes them more immediate and real. Cinematic, even. Who wants to slog through page after page after page heavily peppered with "alleged, claimed, testified, contended, declared, maintained, insisted..etc."? Certainly not me! Thank you for that, Bill! My impression so far is that readers who are non-committal or even skeptical have found my approach to be pretty engaging. I'll be giving a talk at a science fair in a few weeks, and I'm looking forward to seeing how well my book is accepted in that environment!